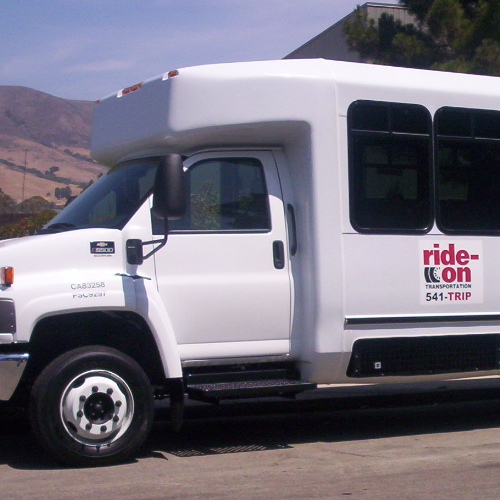 Ride-On Transportation is Your Local, Non-Profit Transportation Company, providing safe and reliable transportation throughout SLO County since 1987. Avoid the hassle of parking, leave the driving to us and really enjoy yourself at this one of a kind event! Cancellations for Transportation to Events must be received 48 hours in advance for a refund. The "Share the Love Fashion Show" at The Alex Madonna Expo Center is a once a year spectacle to behold! Make this Unforgettable Evening even better and Leave the Driving to Us! Our Bus will make two stops to pick up guests: the Paso Walmart at 180 Niblick Road at 4:30 pm and at the Atascadero Park & Ride on Curbaril at 4:45 pm; then on to the event. At 10:15 pm the bus will transport these same guests safely back to their pick up locations. To purchase Tickets for the Saturday Dinner "Share the Love Fashion Show" at The Alex Madonna Expo Center click here: Saturday Dinner "Share the Love Fashion Show"
Transportation is provided separately from the event and Cancellations must be received 48 hours in advance for a refund. In the event that less than 10 seat reservations are booked by Tuesday February 26 this Event Shuttle will be cancelled, you will be contacted by email and will be refunded for transportation tickets purchased.